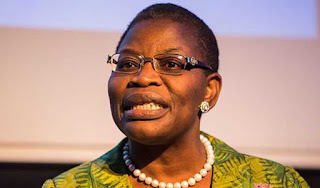 A former minister for education, Oby Ezekwesili, has said that her political agenda for 2019 is to stop the two major political parties in Nigeria – the All Progressives Congress, APC, and the Peoples Democratic Party, PDP – from winning state and national elections. Mrs. Ezekwesili, who is also a co-leader of the #BringBackOurGirls movement, tweeted on Thursday that the essence of her new agenda was to “disrupt and end the political and governance stagnation and retrogression that our cyclical low equilibrium political Russian roulette has cost our country and people. “Enough is enough,” she said, through her Twitter handle @obyezeks. “My political agenda is simple. I shall actively campaign against APC and PDP in the 2019 elections except in rare cases where they field new minds with a strong record of public interest. “I shall actively campaign for the best candidates of all other parties in the elections. “My individual effort to campaign against APC and PDP in the 2019 elections may not amount to much, but it is at least a definite expression of my personal conviction. “My conviction is that it is time to end the tyranny of rulership of a wicked minority political elite class,” she wrote. Mrs. Ezekwesili’s position is a reflection of the general discontentment among Nigerians against the country’s political leadership. Nigeria, with its main earnings coming from oil, is Africa’s biggest economy. Yet most of its population still live in abject poverty. Mrs. Ezekwesili, in her one of tweets, described the APC and the PDP as “twin brothers”. “This for me is the #YearOfTheOfficeOfTheCitizen when all citizens lift their red card. “Whether many other citizens feel the way one feels about our political status quo does not matter. Standing up for what I believe is what one was raised to epitomize. “It is sickening to watch the repetition of a similar pattern of bad behavior by our political class,” she said.